Everything added up to just about perfect. Views of the Santa Ynez Mountain complemented vistas of the Pacific Ocean. A site at the end of one of Montecito’s twisting rural roads ensured privacy, yet the beach was just downhill. For empty nesters, the space worked out well - big enough for a dinner party, but not so large that the hosts rattled around afterward. The hitch? The house. A contractor had built it on spec, and the couple had bought soon after for the setting. The structure met their needs, but it lacked the substance that comes with age. Enter John F. Saladino, a man prepared to chain-whip news beams into old. “It really have admired his work forever,” says the client, who, like Saladino, divided her time between New York and Montecito. She knew, however, that while her house was “absolutely lovely,” it didn’t merit enormous expenditure. “I sent John a lengthy, detailed letter about how we like to live, how we like to entertain, the colors we like,” she says. She also requested that the project be completed in six months. The results are first visible outside. Sydney Baumgartner, a Santa Barbara landscape architect, planted 40-year-old Italian cypress trees near the dramatic wrought-iron entry gates that Saladino installed. Painters stained the 30 inches under the roof’s eaves a darker tone so that the lower walls looked sub-b leached. By the time the clients arrived, they house looked older, sturdier, more in keeping with the Spanish Colonial Revival buildings that dominate the area. “John changed the feeling by putting in a wonderful front door- the difference was subtle and very dramatic,” says the client, who laughs at the complexity of the ironwork closings on the eighteenth-century Mexican sabino wood door. Adding years inside too work, but no new construction. “A lot of the wood and the beam ceilings were newly milled, and looked new,” says Saladino. Devastators beat the beams with chains until the wood looked as if it had been cut by an adze, and painters pickled the beams with a translucent stain. 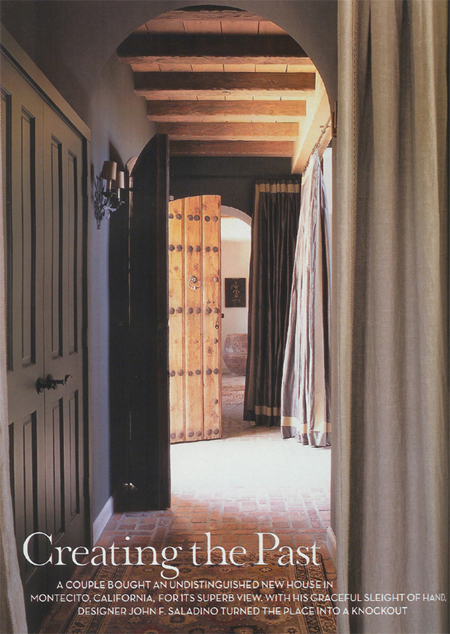 Saladino used a dark teal in the entry, curtaining the walls with silk that responds to ocean-fresh breezes. Going from the darker entry to the lighter main room “ is an emotional experience,” he says. Sun washes a drawing room that Saladino painted “duck pond beige-khaki,” which sets off a substantial eighteenth-century Spanish Colonial chair from Peru upholstered in sedate, red worn velvet. A nineteenth-century Spanish screen, a fifteenth –century French statue of Santa Barbara, and antique Dutch carved corbels add a past to the room. Next to the fireplace is an iron penitent’s chair “ so uncomfortable you couldn’t sit in it unless you’d sinned,” says Saladino, who used it to stack firewood. The clients’ collection of photographs “is the music that runs through the house,” Saladino says. There are four images, striking nudes by Lisa martin, in the living room alcove, which is furnished with a Summer sofa from Saladino’s line. In contract to the drawing room is the cozy adobe-colored dining room, which Saladino designed as a night room. An eighteenth-century Dutch wood cabinet in a refined rustic style commands the space. A bench from Saladino’s line eases the formality, and the room’s defined dimensions draw guests into one wide-ranging conversation. A subtle stenciled design runs along the beams here and in the kitchen, where French doors open on to a terrace. A nineteenth-century French oval wine-tasting table with fold-down leaves enhances the warm feeling.